Sometimes people catch you off guard. I was definitely caught off guard A couple of weeks ago by the salesman Michael Acosta. Before you jump to conclusions it was in a good way. I had only went to Berman to do my first oil change, check up on the car, and a car wash. He was so very nice to me and gave me his card, walked me around the whole lot, and told me the specs of each and every car we walked by. He literally made me feel welcome to be there, even though I was only there for servicing my car. He never looked at me sideways like she’s not gonna buy anything, she’s just wasting my time, or she’s just killing time while her car is here. Just randomly out of the blue today my daughter decided it was time for her a new car. Funny thing is, I had spoken to him two weeks ago about possibly buying her a car. She has a newer truck, and really has no reason for a new car. But work Mama Bears Cubs want, they get. This time, I turn the tables. I told my daughter if she really wanted it, she would need to use her own credit. Michael helped us from the time we walked in till the time we left... with her new car! Her dad came up to the lot and was so very proud of her and so was I. Micheal made her first car buying experience a totally memorable one! I am so excited to say she is a new INFINITI owner!!! The place was well lit, very clean, the customer service was exceptional and I have no problem with saying..... I would totally recommend!!! Very positive experience with David & Mike. Felt like we were taken seriously and valued. Tim was very helpful in resolving an issue for us and Nathan worked the numbers to our satisfaction. Larnell helped us with getting the most for our trade-in. All in all a great experience with Berman Infinity! I can't say enough on how attentive and sincere Tim Curan and his entire team was, and still are after purchasing our 2019 Qx-60! I'll just summarize, everyone and everything from beginning to end was a true pleasure! Thank you to Tim, Nate, Kendall, Sam, Anthony, Chuck, Gary, Nick, Rico and anyone else I might have missed... all of you are nothing short of amazing! 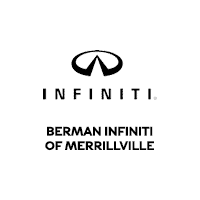 If you want 1st rate service, then Berman's INFINITI of Merrillville is your place to purchase your next vehicle and service it! Super friendly no haggle car buying experience! I’ve known the Berman brand for a long time and am happy to have finally gotten a car from them . The manager Tim made everything easy and comfortable and I got a great deal on the car I wanted . never did they try changing my mind , swaying my vehicle choice . my salesman Anthony was knowledgeable and there for questions without being pushy or overwhelming. And my finance guy Nate knew what I wanted to spend got me a stellar rate without having to over run my credit and kept me in budget . I know it wasn’t a big sale for them but the Berman group definitely has my referrals and recommendations to anyone looking in the future . Berman INFINITI of Merrillville is proud to be your top-rated dealership! You can find our new and used dealership on 1794 W 81st Ave. At Berman INFINITI of Merrillville, it’s our goal to exceed your expectations from test drive to delivery and beyond. Please feel free to check out our extensive inventory of new and pre-owned cars and SUVs. In addition to our knowledgeable sales staff, we also provide financing, service, and parts. If you’re looking for an INFINITI in Northwest Indiana, visit Berman INFINITI of Merrillville today or contact us to schedule a test drive. We would also like to invite Crown Point, Schererville, Hammond, and Valparaiso INFINITI customers to our dealership.